This is a note from my friend Joseph Ciza that was passed on by another friend. He writes from Goma on Saturday, and I'm posting this in hopes that he won't mind getting his story out so you can know more. It's long, but I'm asking you to please read it. It's important to me. "A tense but quiet night, thank God. In the early evening, there was gunfire by the airport, and we thought, “This is it! They are attacking!” But it died down. It was probably looters meeting a patrol. Col. Padiri has given orders to shoot looters on sight. Two dead men in military uniforms were left outside ULPGL gates (Université Libre des Pays des Grands Lacs), to make sure the message gets through to the others. "I left the house at 8 am. It makes my children anxious when I leave. My oldest son, Jean-Felix, who is six years old, has refused to eat. He is afraid all the time that the soldiers will break in. He asks, “When will the war end? When can I go back to school?” Even if some shops are open again in town, the schools have not re-opened. The stalemate could flash back into war at any minute, so parents are afraid to let their children out of their sight. "My wife is also anxious when I leave; she is finding it hard to feed us. No fresh food has come into town because no one will risk sending their truck out past the multiple army check points. The depots are not open, for fear of looting; a sack of beans is selling for 80$. A few Rutshuru traders got their trucks into the humanitarian convoy yesterday, bringing some vegetables and bananas to the market. "I took a car and drove out of town to Kayaruchinya, a health center just north of the airport. There’s not much traffic about because people don’t want to risk their car or motorbike being requisitioned by the military. What a contrast to the usual scene of bumper to bumper vehicles, with the cloud of motorbike taxis weaving in and out like mosquitoes. "The scene in Kanyaruchinya breaks my heart. There must be around 10 000 people crowded round the health centre. They are despondent, sitting in lines, waiting for someone to bring them help. The scenes of yesterday are fresh in their memory. Two children were crushed to death underfoot by adults in their rush to grab a handful of biscuits. These people have been waiting in the torrential rain, and the sun, without shelter, without water, since Tuesday. Kanyaruchinya is at the foot of the volcano: there are no wells, no streams, and no piped water in this vast expanse of black volcanic rock. "Since the beginning of this fresh round of fighting, our hospital with 150 beds has received 42 war wounded civilians, 27 of them from Wednesday and Thursday. 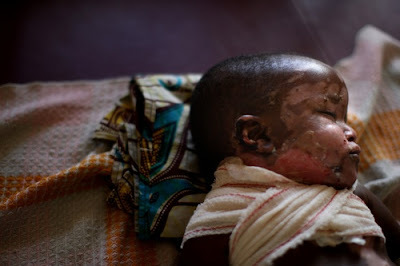 I am so sad to see a little five year old girl, whose face and chest is completely burned. She just happened to be passing by a group of youngsters who had collected bullets around the edge of the army camp. They were playing with them, burning them, and some cartridges were still live. This little girl happened to be at the wrong place at the wrong time, when the live bullets exploded in the fire. "Bernard Kouchner and David Milliband arrive around 4 o’clock. It’s pouring torrential rain. European security forces are all over town; we don’t know where these two are going, or where they are staying or who they are seeing. But their arrival is a glimmer of hope for us. We are convinced that our town was saved by the outcry in the world, pushing these big powers to get involved. "It’s evening, and I’m going home after the rain. I can see some Goma people straggling back into town. These are the ones who fled to Sake on Tuesday. And then there are the new arrivals, the people who have been on the run all this year. It’s pitiful to see mothers spreading their tattered cloths on the bare black rocks of Goma, and huddling against the wooden walls of houses, surrounded by their hungry children. They are begging for food. When I talked to some of them this morning, their one question was: When can we go home? Many of them have been living like this since April, with no help. They have survived by digging other people’s gardens in return for a share of food. If there will be no more fighting, they want nothing more than to go home. "Back at home, I am so thankful for our meal of beans and rice. It comes from the stock we bought back in October. Always the same thing, but at least we have food on the table. The neighbourhood is quiet. There are many patrols of military police, and anyone suspected of thieving will be shot. So everyone stays inside, under voluntary curfew: no one comes out for fear of being mistaken for looters.